Yamaha has announced its all-new DTX400 series. This means that three new models, the DTX400K, DTX430K and DTX450K, are bringing the DTX's features to players at starter kit prices. 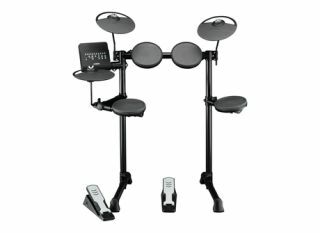 Features packed into the kits include a USB connection which enables the player to control VSTi drum sound libraries and record directly to computer software. It's also possible to import new songs via Yamaha's Music Soft Downloader. New Apps will also be launched in 2013, designed to work alongside the DTX400 series to present an exciting interactive learning experience. The sounds within the new DTX400 module include stereo recordings of real drums, cymbals, and percussion instruments that respond to playing dynamics for truly musical expression. Users can also create their own 'bespoke' drum kits from the library of over 165 drums sounds, including 23 snare drums, 21 kick drums and 42 other percussion instruments. DTX400K will be released in September 2012, with the DTX430K and DTX450K due to arrive at the beginning of 2013.